This catalogue describes some 900 works published from 1550 to 1850, as well as 300 additional items reprinted in collective works, all in the library of the School of Oriental and African Studies, University of London. It therefore covers the first great phase of Western involvement in China, ranging from reports of envoys to khans of the medieval period down to the writings of diplomats, merchants, military figures, missionaries, and so on of the early 19th century. As might be expected, many rare editions are included, for example, a handful of those rarest of prints, the xylographs published in Macao or Beijing in the 17th century. The catalogue is classified by subject area of publication, and includes indexes of authors and titles, as well as a supplementary subject index, and Chinese title index. 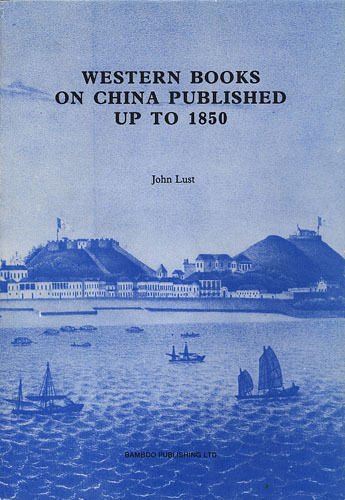 John Lust, now retired from the library at SOAS, is well known for his bibliographic compilations, including the Index Sinicus 1920–1955, a catalogue of periodical articles relating to China.